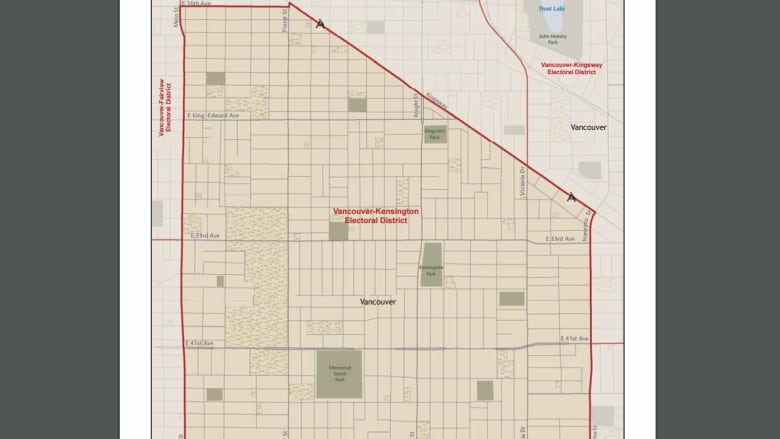 A look at Vancouver-Kensington, one of the 87 electoral districts in British Columbia. In advance of the 2017 B.C. election, we'll be profiling all 87 electoral districts in the province. Here is Vancouver-Kensington, one of 11 ridings in Vancouver — and one that could be among the most closely contested in the city. 1. Every politician has different reasons why they love campaigning, but in Vancouver-Kensington it may have less to do with people. "Some people say we've got the best food on the campaign trail," said Mable Elmore, the NDP MLA who's represented the riding since 2009. From the eclectic mix of restaurants down Main Street, to the Filipino offerings down Fraser, to the "second Chinatown" along Victoria Drive, the riding is marked by dense, duplex-heavy residences, separated by East Vancouver's famously diverse set of main thoroughfares that dominated by small businesses and local restaurants. "You can see the diversity just in the stores, the different restaurants, markets and little boutique shops," said Elmore. "Pretty much everywhere you go, you can get that sense of it." 2. Aside from being one of the most diverse ridings in B.C., it's also one of the most walkable. East 16th Avenue, Kingsway, Nanaimo Street, East 49th Avenue, and Main Street: those are the five streets bounding the riding, with Mountain View Cemetery the only major green space intruding on the homes and commercial strips, making it the smallest in Vancouver outside of Downtown. "I can door knock from one end to another in three hours. It's a big difference from other colleagues. Even in the suburbs, it's a bit tougher, and doesn't compare to the Interior, where it takes 16 hours to drive," said Elmore. 3. Elmore seeks a third term in Vancouver-Kensington. She hoped to make the jump to federal politics, but the lost the race to replace Libby Davies as the NDP's Vancouver East nominee to fellow New Democrat MLA Jenny Kwan. It's a riding that has been decided by 1,500 to 3,000 votes in each of the last five elections — and while the NDP won four of them, the margin indicates that the NDP can't take this seat for granted. 4. The Liberals will once again put resources into taking this from the NDP. Kim Chan Logan has served as director of government relations for Telus since 2005 and has sat on a variety of local boards in the region. Her pitch to voters is rooted in her experience: that collaboration and listening to stakeholders will produce better results for Kensington voters than what she calls "confrontational politics"
"People are ready for a more positive and constructive voice for our riding ... my ability to listen to other points of view, and unite people towards the problem that we're trying to solve, has been a winning formula to me." The Green Party has received between 6 to 10 per cent of the vote the last four elections in Kensington. Its candidate is Simon Rear. 6. Where does the NDP do well? The polling stations surrounding Mountain View Cemetery tend to support the NDP the most, giving them over 65 per cent of vote in recent election. The party also does well generally in the half of the riding west of Knight Street. 7. What about the Liberals? The party's strength in this riding is focused in the southeast corner, between Knight Street, East 49th Avenue, Nanaimo Street and East 33rd Avenue. 8. In a diverse riding, Elmore and Logan come from the two largest ethnic blocks in the riding: Chinese and Filipino-Canadians. English is the mother tongue of just 37 per cent of residents (as of the 2011 Census), and Elmore has been through enough elections to prepare for the campaign accordingly. "I hired ... someone who speaks Cantonese, someone who speaks Mandarin, someone who speaks Tagalog. To engage those folks is important, so you translate materials to communicate with folks when they have issues," said Elmore, B.C. 's first MLA of Filipino heritage. "It's a challenge, but that's the future of the Lower Mainland. It's moving in that direction." Logan said her great-grandfather, Quai Chan, immigrated to Vancouver in the late 1800s and helped found a benevolent society before moving back to China. She says her family made the permanent leap to Vancouver in the 1960s. "I learned complaining about things didn't get me anywhere. Learning what my dads and brothers went through just to get to this country, I feel embarrassed complaining about the things I do, because they went through a lot to escape the communist regime," she said. "It's an interesting riding to live in and have the potential to represent. It showcases the best Canada has to offer ... people don't just want elected officials to focus on the problems, but they want people to focus on the opportunities." Who's running in the 2017 B.C. election?